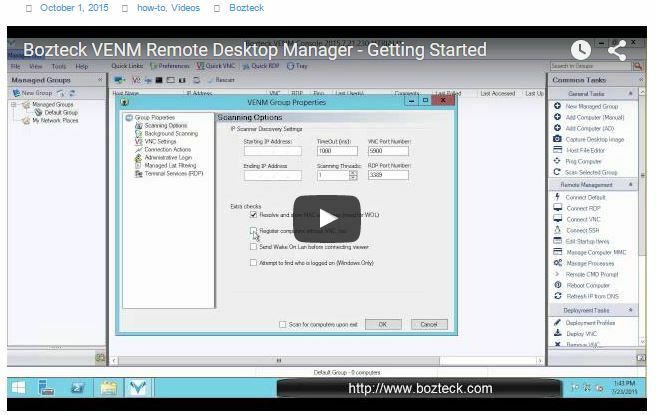 This video tutorial video introduces you to Bozteck VENM Remote Desktop Manager. Bozteck VENM is a powerful Remote Desktop and Systems Management console that is relied upon by IT Professionals in virtually every developed country spanning a multitude of business, government, and organization sectors. This entry was posted in how-to, Videos and tagged bozteck, Deploy, Powershell, RDP, remote desktop, Scripting, TightVNC, ultravnc, venm. Bookmark the permalink.